Since blackjack appeared in France in 17th century and became popular in America in 19th century there have been written rather decent amount of different tips and blackjack articles how to win in blackjack. Considering the fact that blackjack is a game of skill, as opposed to most gambling games, players are strongly advised to learn the rules of the game firstly, understand how blackjack odds are calculated in order to choose the most favorable table in casino where the most advantageous blackjack variation is played. Let us describe you some common features of the game that would provide you with information how to win in blackjack. 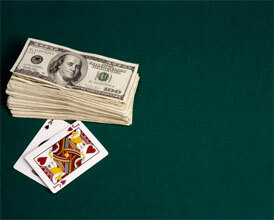 The main goal in blackjack is to beat dealer's card combination without exceeding the upper limit of 21 points. To beat the dealer means that players end up the game with larger quantity of points than dealer gets. aces could be worth either 1 or 11 points regarding player's decision. At the very beginning of the game a dealer deals 2 cards for each player and for himself/herself, which could be either faced up or down depending on blackjack rules. Further, gamblers are allowed to look at their cards and try to access their chances to win or, in other words, to hit the house. If gamblers have a blackjack, or a natural, which means that their initial card combination is worth 21 points, they are automatically regarded as winners and may not beat the brains choosing which bet to make. In any either event the next step is crucial for players' game results, so they should consider carefully which blackjack move to undertake: stand, hit, double, split or surrender. In order to make a right choice experienced players usually follow some game strategies, which are notable basic strategy and card counting. The first playing system is regarded as rather useful and not very difficult in usage, so it is more appropriate for blackjack newbies. Conditionally on its correct application, basic strategy could decrease the house odds down to 0.5%, which is really low index. On contrary, card counting is considered as highly sophisticated method and is recommended for professional players. Though, mastering card counting is quite difficult process, but it is really worth to learn it regarding the fact that this strategy could allow players not only to reduce casino odds, but even to convert the house advantage to their own.